Debbie and Kevin McQuilkin sit on their porch at 757 Oenoke Ridge. The couple bought the house, which was built in 1886, two years ago. Aug. 23, 2013, New Canaan, Conn. The porch at 757 Oenoke Ridge nearly encases the large brick house. On a recent Friday morning, several chickens were pecking along at the foot of the porch's steps. 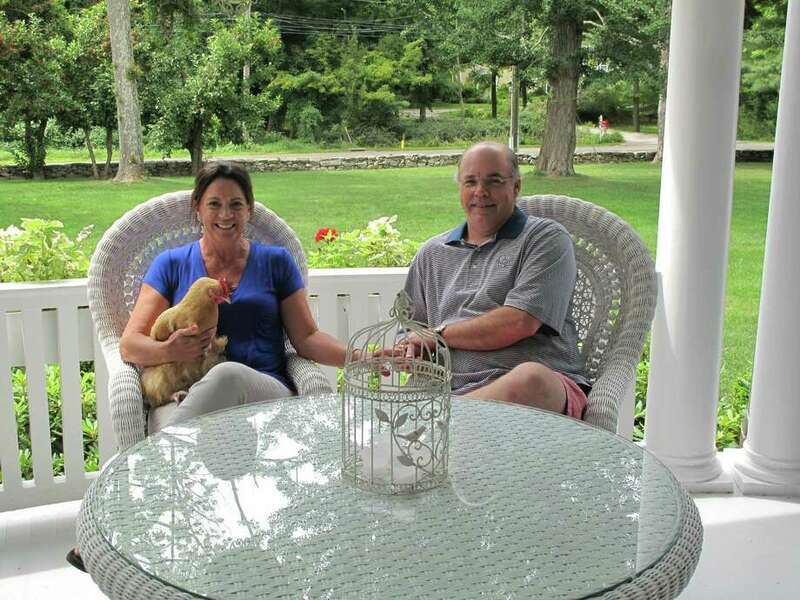 The chickens belong to Debbie and Kevin McQuilkin, who bought the house two years ago, but have lived in New Canaan since 1990. Aside from the porch and home, the four-acre property has a cottage and three original barns from the 1800s. The porch has a white railing and pillars and an off-white floor. It's furnished with white wicker and cushions with colorful patterns. "It's built for entertaining," Debbie said. "Even in the winter, if it's mild enough we might set the bar up out here." Last year, she said, they had a party for alumni of Gonzaga University, Kevin's alma mater, where one of the couple's four children attends. Two of the others are in college, and one attends private school in Stamford. "It's big and airy," Kevin said of the porch. "We'd had porch envy for awhile." On the corner of the house is a marble inlaid plaque in the brick, which states that it was built by Dr. Charles Riley Abbot in 1886 to 1887. "There's evidence of carriage horses and there used to be a formal garden," Debbie said. "It was a donkey farm two families ago. We would love it to be a small working farm again and have the school kids come in and make sure buildings are preserved. I wake up every morning and love this house. I can't believe I live here." The original home was built in the 1830s, along with the barns, but it burned to the ground. The barns survived and the home was rebuilt in 1886 by Abbot. In those days, the home and barns were part of a 45-acre estate owned by Abbot and his first wife, Jane Humphrey. The Abbots were a first family of the town, according to the New Canaan Historical Society, of which Charles Abbot was a founding member. He was involved with the church and was a professor in New York, according to the historical society. According to an 1896 marriage announcement in the New York Times, Abbot was the principal at P.S. 1 in Brooklyn, where he lived on 255 Lafayette Ave., in what is now known as the Clinton Hill neighborhood. The announcement was for his second marriage, at age 73, to a 30-year-old teacher in his school, Alice Day. Abbot was principal of the school for 20 years by 1896, and previously served as the director of the New-Jersey State Normal School, which is now the College of New Jersey. In keeping with the theme of farmhouse, one of the barns has been re-purposed as a chicken coop, in which Debbie keeps roughly two dozen hens. It is probably one of the only chicken coops in the world with a functioning chandelier hanging from the ceiling over the hay. The hens are of all different breeds, including Polish; "Easter Egger," which lay mint-green eggs; and black hens. The McQuilkins get several dozen eggs a week from their hens. Several of them visited Debbie on the porch as she talked. "My husband and I always wanted a big wraparound porch, so having it on this house is heaven. It feels a bit of a novelty," she said. Do you have a great porch? We'd love to hear from you! Contact reporter Tyler Woods to tell us about your porch.